Walton was once the village of which Felixstowe was a fishing hamlet. But the gargantuan child has swollen and engulfed its mother, and Walton is just a western suburb of Felixstowe now. 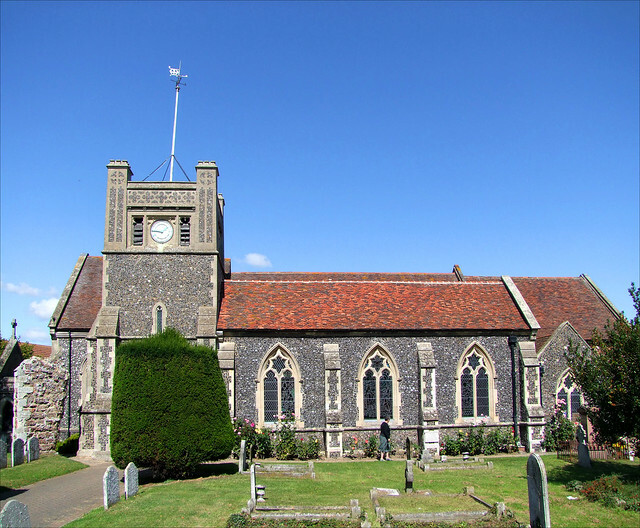 Indeed, it is almost an inner-city; the 19th century terraces of Walton High Street are just a few hundred yards from Hamilton Square in the middle of Felixstowe, and this church is closer to the centre of modern Felixstowe than the medieval Felixstowe parish church is. However, there is one remarkable fact about the parish of Walton which should not go unnoticed by anyone interested in the history of Suffolk Christianity; it was probably the Dumnoc where the Burgundian St Felix came ashore in 631. He had come to convert the heathen English, and was the first Bishop of East Anglia. His mission was established in Walton Castle; Walton, therefore, was the site of East Anglia's first cathedral. Walton's modern livelihood comes from Felixstowe Docks, and as such it is a 20th century prosperity. In earlier years, this was a poor old place, like so much of the coast, and St Mary was completely derelict by the mid-19th century. The tower had fallen like those at Alderton and Bawdsey across the Deben, and St Mary was given a going over even more thorough than that of the two Trimley churches further along the High Street. What we see here, then, is virtually all Frederick Barnes' rebuilding of 1857-67, and the work seems to have been carried through in two stages, the first replacing tower and aisle, the second chancel and west end of nave. There are remains of the medieval building to the south of the tower, but none you'd get terribly excited about. The original plan seems to have been kept to, with a tower on the south side of the nave only later added to with a south aisle. Barnes was also at work on the rather wayward St Andrew, Melton at this time. Integrating remains of the former church seems to have kept him on track a bit more here. The inside is similarly wholly Victorianised, as you'd expect. The font and brass on the wall are about the only survivors, and much more interesting in any case is the excellent 20th century glass. One window depicts Christ calming the waters, and in a nice touch St Peter in the boat is accompanied by a lifeboat man in oilskin jacket and sou'wester, believed to be the only such depiction in England. Rather less good is Paul Quail's nativity on the other side of the church, but perhaps the best modern window is hidden away in the vestry below the tower, depicting St Cecilia and St George. This evangelical community has kitted out its happy, friendly building for modern worship, with carpets and modern chairs. I'm sure St Felix would thoroughly approve. Walton Castle, where he established his see, had been built by the Romans as a great coastal fortress, like the more famous example over the Norfolk border at Burgh Castle. If you'd like to see Walton Castle though, you'd better bring some waterproofs, and even an oilskin jacket and sou'wester will not be enough, since it now lies half a mile off Old Felixstowe, under the grey North Sea.